Recently, my colleague, John Burk, announced on his blog a job opening in our department. John does a fantastic job of describing the school and what working here at St. Andrew’s is like. I’d like to add a little more to what he said. If you got here by way of John’s blog, then great; I’ll try to add to what he said. I haven’t blogged much over the past year, so I imagine most everyone reading this is only doing so because they saw John’s blog first. So what is it like to work here at St. Andrew’s School? Well, if you like to be outside the hub-bub of city life, St. Andrew’s is a great place. Just an hour from Philadelphia and two hours from Washington, D.C., Middletown, DE is conveniently located, but with some small-town charm. There are a lot of commuters (to Wilmington) who have filled in the houses that grew in the local farm fields, but the area around St. Andrew’s has been preserved in woodlands, wetlands and farmlands (mainly due to the efforts of St. Andrew’s to acquire land in the area). I regularly see bald eagles out my window, looking out over Noxontown Pond. It’s a beautiful, and mostly quiet, place. Our students are an eager and enthusiastic bunch. Through the ceaseless efforts of our Headmaster, Tad Roach, and the rest of the faculty, there is no serious disconnect between the adult and student cultures. I have colleagues at other boarding schools who periodically share tips on how to know when students are up to no good. I’ve never needed those tips. Of course our students make mistakes now and then (they are, as I like to call them, apprentice adults), but there is no drinking or drugging culture here. To put it simply: our students have no problem having their fun in full view of the faculty and each other. The student culture here is truly remarkable, and the older students protect that culture with fervor. As a faculty we like to collaborate, and we like to collaborate even more than we actually do. This is always a source of friction, as the hectic day of a boarding school teacher can make collaboration particularly tough. But we gallantly take on this tough task, and the results are pretty spectacular. I talk with John Burk about teaching every single day. I am also part of an Innovative Teaching Collaborative where I share ideas and run lesson plans by a group of teachers outside my department. It’s hard for me to make that meeting, but the meeting exists, so I make sure to get there! In the physics classroom, John and I are always looking for better ways to do things, and to that end, we collaborate with teachers outside the school. For the past three years we have hosted a summer Physics Teachers Camp where ten of us from up and down the eastern seaboard spend four days immersed in physics fun (as well as create course materials and plan classes). So this sounds perfect, right? Why doesn’t everyone want to teach at a boarding school? Well, it can also be hard. Evening study hall or dorm duty (usually once or twice a week), sports after classes, away games, advisee meetings, dinner duty (every third week) and weekend duty (every third weekend) make for a very, very busy life. Being with the students this much is actually amazing, since you get to know and understand them so much better than if you just interacted with them in the classroom. In addition, the students come to know and understand your life much better, as well. While this might sound overwhelming, it isn’t overwhelming on a continual basis, and there are the breaks! Rarely do we go more than five weeks without a long weekend or holiday. The stretch between fall long weekend and Thanksgiving this year was six and a half weeks, the longest uninterrupted stretch of school that I can ever remember. But then Thanksgiving holiday started on the Saturday before Thanksgiving and ended this Monday evening. A nine day break for Thanksgiving may seem like an unusual luxury, but such a break is necessary after six weeks of a boarding school schedule! Hopefully this gives you a little more information about the job here at St. Andrew’s. We’d love to hear from you. This morning I ran across a New York TImes article titled At Charter School, Short Careers by Choice. The gist of the article is that some charter school tolerate or even encourage young teachers moving on to other careers after three or four years of teaching. I guess the idea is that youth and enthusiasm far outweigh expertise and experience. Call it the Teach for America model, if you like. My first two or three years of teaching were filled with my own learning about how to teach. It took me a few years to become really good at what I was doing. I don’t think youth would have sped that process up at all (especially as I remember what I was like right out of college). So from my own experience, the best teaching I’ve done started occurring five or so years into my teaching career. I’m not unique (watch Ira Glass explain how long it takes to become really good at something), rather the time and concerted effort it takes to become masterful at an endeavor is a well understood fact of life. How do you sustain the hard work during the dismal early days when you know you are pretty much stinking it up at a new endeavor? Well, for one thing, it helps tremendously to be committed to pursuing that endeavor for a long time. How is it that the charter school administrators are so smitten by the rank inexperience of their young teachers that they are anxious to move these teachers out just as they are starting to become accomplished? (A hint in the article may be the youth of the administrators themselves.) I worry that deep down, underneath the infatuation with the Teach for America model, the real answer lies in the belief that teaching isn’t really a skill that you have to put much effort into. In the final quote of the article, 24-year-old Tyler Dowdy says “I feel like our generation is always moving onto the next thing, and always moving onto something bigger and better.” This tells me that Mr. Dowdy considers teaching, or at least his own teaching, to be small and not so good. I know I said my next post would be about ways of teaching Newton’s Third Law, but that was a long time ago. I’ll get to that over spring break. For now I’d like to expand upon something that I originally wrote to the Modeling Listserv about getting more girls interested in physics, especially second year (“AP” or otherwise college-level physics). Hire and retain female science faculty. This is very important– perhaps most important. It is great to have female physics teachers, but even if female biology and chemistry teachers “talk up” physics by making connections to their courses, it makes a huge, huge difference. It is especially important that female biology and chemistry teachers not “talk down” physics. I’ve seen this happen in very subtle ways, and the effects are pernicious. All physics teachers (and anyone else who is in a position to talk to students about their science course choices) should “talk up” physics. By this, I don’t mean putting up posters, making announcements at school meetings, etc. What I mean is having one-on-one, meaningful and deep conversations with the girls at your school. From the time they get to your school, girls should be getting encouragement to explore math and science. Personal conversations are key. You have to get to know the kids in order to influence them. If girls see women doing science and teaching science, they are less likely to uncritically accept societal norms that tend to discourage them from science. Somehow this seems totally obvious to me. Am I wrong? Also important is what girls hear from adults around them. If taking physics is a common expectation, then all students are more likely to consider physics a natural step in their science training. I can’t stress enough how important it is to get to know future students. I often feel as though the most important thing I do each day is to eat lunch or dinner with students- not only students I’m currently coaching in class, but students, young and younger. By eating together, they see that I am human. They see that I love my job and that I am eternally excited about physics. And I get to see their fear, worry, curiosity and excitement. In the middle of that big mess, we somehow connect and they find themselves, somehow, wanting to know why physics is so interesting. You can’t do this with presentations or posters. You have to have the human interaction. Recently on the Modeling Instruction listserv there was a discussion about difficulties that students have with Newton’s Third Law and how teachers might best address these difficulties. It appeared to me (and I contributed to the discussion saying so) that some of the language being used by teachers was leading to student confusion. It also appears to me that previous student experience with how the the Third Law is commonly explained (even well before high school) might be responsible. Finally, there are several different difficulties that students might be experiencing (arising from different conceptual issues) when they fail to use Newton’s Third Law correctly. Newton’s Third Law is taught in first year courses as The Principle of Reciprocity, not as a law of motion. While this is a possible source of confusion, I believe it is still a good idea. The popular version of the Third Law involving the words “action” and “reaction” is actually a law of motion. The words action and reaction as used by Newton do not refer to forces. The use of the phrases “action force” and “reaction force” is a definite source of confusion. Much of the easily available information on Newton’s Third Law is presented incorrectly, and serves to reinforce student misconceptions or even confuse students further. Students have heard the Third Law presented as the Principle of Reciprocity disguised as a law of motion by teachers who don’t understand the difference, yet students think this is the one law they really do understand (since they can recite it) and are thus loathe to give it up! If object A exerts a force on object B, then object B exerts the same kind of force on object A, with the same magnitude and opposite direction. As stated above, this Law says nothing about the motion (or changes in motion) of either object, yet it is the third of what are often called “Newton’s Laws of Motion.” Already we start to see why students get confused. Often students try to use the phrase “same magnitude and opposite direction” to attempt to come to some conclusion about the motion of a single object, leading them to falsely assume both forces in question are exerted upon that single object. The concept stated above is more accurately described as “The Reciprocity Principle,” in that it describes a relationship between the two forces involved in a single interaction. The Reciprocity Principle, as so stated, is not even universally true. Take, for instance, two protons, proton A moving in the positive x-direction, proton B moving in the positive y-direction. Calculate the instantaneous electric and magnetic forces that proton A exerts on proton B. Now calculate the instantaneous electric and magnetic forces that proton B exerts on proton A. Do this and you’ll see the point–there exists no reciprocity for those magnetic forces between individual charged particles! So was Newton wrong? I’ll comment on that in the next section. For now let’s concentrate on why we would phrase Newton’s Third Law of Motion in a way that isn’t a law of motion, and doesn’t actually hold true for magnetic forces. The point of introducing Newton’s Third Law this way is that the Law of Reciprocity is a very good model for almost all interactions we encounter during a first year of physics at the high school or college level. The Principle of Reciprocity gives our students a tool with which to attack more complex situations involving several objects interacting within a system. As a bonus, we give ourselves a nice way to introduce the Principle of the Conservation of Momentum.These are good pedagogical reasons to teach the Principle of Reciprocity, rather than the Third Law as stated by Newton. What Did Newton Actually Write? To every action there is always an equal and opposite reaction: or the forces of two bodies on each other are always equal and are directed in opposite directions. Gracious me. Newton’s explanation starts out talking about forces and pressures, speaks of obstructing and advancing “progress,” and finally ends up talking about what appears to be momentum. I’ll say right here that I am unimpressed with the clarity of Newton’s explanation. I go back and forth between thinking action/reaction should be read as the change in motion as opposed to being read as the thing that changes the motion. But rather than pick nits (and criticize an author who can’t defend himself), let’s zero in on what Newton seems most intent upon telling us in this, his third law of motion: there is a specific relationship between the changes in the motions of two interacting objects. Hence, this is a law of motion. In fact, it appears that Newton’s Third Law is a statement of the conservation of momentum for the situation of two isolated (“if the bodies are not hindered by any other impediments”), interacting objects. Although Newton didn’t know about field momentum, the momentum interpretation of the Third Law almost works for the case of two interacting protons that I cited above. If you take proton A, proton B and the electromagnetic field as your system, the momentum of the system is indeed constant, but this is no longer a two-body problem. The Principle of Reciprocity, by focusing on forces rather than momentum, misses the momentum that is gained by the electromagnetic field. Besides noting that Newton’s version of the Third Law being an actual law of motion, I’d like to make the case that the terms “action” and “reaction” should be dropped because of the confusion they cause. Regardless of what Newton meant, today these words have no meaning in terms of forces or changes in momentum. Some of the discussion on the Modeling Instruction listserv revolved around students mistaking the “reaction” for the change in motion. Well this makes perfect sense, given our current understanding of the word reaction! We could clearly define the words action and reaction for use in the physics community (much as we clearly define work, energy, momentum, etc. ), but we rarely use these words except to talk about the Third Law. Introducing new terminology only to abandon it soon afterwards is simply confusing to the student. Don’t do it. The only good use of action/reaction is for the name of a blog. What Can Students Find on the Internet About the Third Law? Sadly, much of the help for Newton’s Third Law that is available for students on the internet is poorly explained or just plain wrong. The confused student is very likely to seek help where help is supposed to be. Why wouldn’t a student struggling with Newton’s Third Law not simply pop “newton’s laws of motion” into a search bar? If they do, they will find the world stacked against them. The first hit on just such a Google search results in a college site (must be vetted, no?) that gives the standard unhelpful “For every action there is an equal and opposite reaction” followed by a single example that talks about motion (not forces, not changes in motion, but motion). This example does nothing to help explain the Third Law. So the student keeps looking. “Hey, next is rice.edu? Mr. Hammond went to Rice, this should be good.” The same unhelpful phrase is given followed by an example of a rocket. However the example misidentifies the appropriate force-pair and seems to indicate a rocket cannot accelerate unless it has the ground to push off of… confusing. Go on to the third hit, which leads to Wikipedia. Lots of symbols, calculus right off the bat, Latin, blah, blah, blah, nothing helpful to the beginning student. The fourth hit: NASA. Now we’re making progress! But the worksheets from NASA all include the misconception that both forces described by the Third Law are exerted on the same object! That’s right, the NASA site is dead wrong! Fifth site: Discovery Channel! Yay, TV! Yet the physics is all wrong, making the same mistake as the NASA site. Sixth site: physics4kids.com, a terrible website full of incorrect physics, including an incorrect explanation of the Third Law (same mistake as the NASA site made). Finally, on the seventh and eighth hits, we get some explanations that are correct and might be useful to the beginning student. How many students are going to get past the unhelpful and incorrect explanations (which probably coincide with their current misconceptions)? Oh, you can go look at Khan Academy. At least they changed their wrong explanation after some physics teacher complained (who was that?). But for reasons I’ll explain in my follow up post to this one, passive explanations don’t really get you too far unless you are already almost there. What Do Kids Bring to the Classroom Regarding the Third Law? Unfortunately, the frequency with which I hear students spout “for every action there is an equal and opposite reaction!” whenever they see any two forces pointing in opposite directions with equal magnitudes tells me that this kindergarten version of the Third Law is omnipresent. The students are presented with this version in middle school or on TV science programs, and they have probably had at least one confused adult give an incorrect explanation of what it means. For such a widely memorized tidbit, there sure is a lot of misunderstanding about what it means! To make things worse, many kids come into physics thinking that this is the ONLY bit of physics they already understand! In many school settings, the Third Law is stated simply as “for every action there is an equal and opposite reaction.” This might be fine if the explanation that followed developed action and reaction as changes in momentum. But nearly universally, this version of Newton’s Third Law is followed by a lot of talk about “action forces” and “reaction forces” and very little talk about what objects are exerting forces and what objects are being subjected to forces. Most middle school textbook explanations I’ve seen are simply impossible to understand. I have some ideas about how to address student misunderstandings of the Third Law which I’ll share in a follow-up post. Some of the students’ misconceptions are actually astute observations hindered by lack of a consistent conceptual framework for incorporating those observations. That is, rather than just being ignorant, the students are trying quite hard (and almost successfully!) to make sense of the world. This should be a very strong position from which to start! Back to the slinky drop. The last of the Veritasium videos shows a slinky with a ball attached to the end being dropped (as opposed to the slinky stretched only by it’s own mass). This particular video is here. The ball-on-slinky video appears to show the ball moving downward almost immediately, as opposed to the slinky-alone situation, where the lower coils do not move until the slinky has collapsed upon itself. In the comments to the Dot Physics blog where Rhett Allain has posted a computational model of the slinky drop, it is suggested that the mass of the ball shifts the center of mass lower in the slinky-ball system, thus making the lower end of the system move sooner. This puzzled me, because the ball seemed to move right away. Now I think that shift at 0.01 s is due to the limits of my ability to click in the same place on the video when selecting points. At any rate, nothing much happens until after 0.06 s. But let’s see, even if the top of the slinky is initially obscured by fingers, maybe we can get some kind of information from tracking the top edge of the slinky as soon as we can see it. Here’s the data. Now I can’t really see the top of the slinky until about 0.09 s. But I feel good about my ability to track the top of the slinky after that. Note that the slinky is still speeding up until 0.012 s. And the position at 0.09 s is pretty close to where I would suspect Rod’s fingers are gripping the top coil, given the shape of his hands in the video. So it appears that the slinky is definitely not released until somewhere after 0.06s. Note that by this time (0.06s), the ball at the bottom of the slinky is already moving at a constant velocity! When the top of the slinky is finally released, the entire system is moving downward at a constant velocity. Rod must have shifted his hands at the very last moment (or the last 0.05 s) before releasing the top coil. Or maybe the ball was in the middle of a bounce when it was released (I wish the video had started about 0.1 s earlier!). 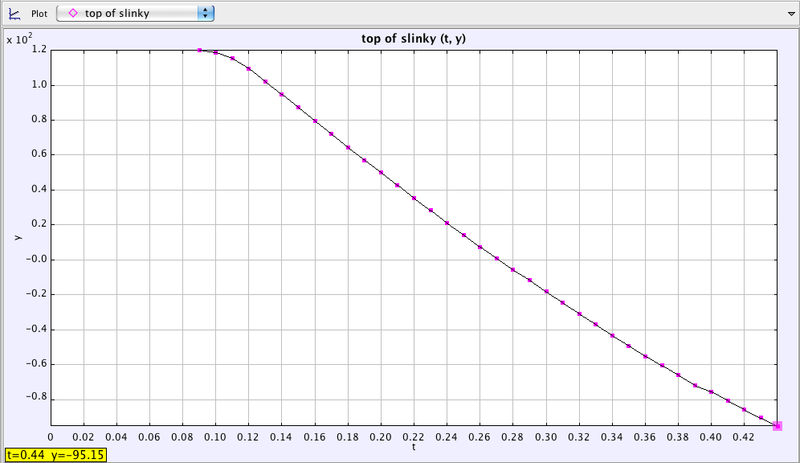 By the way, 0.42 s is about where the slinky is fully compressed. 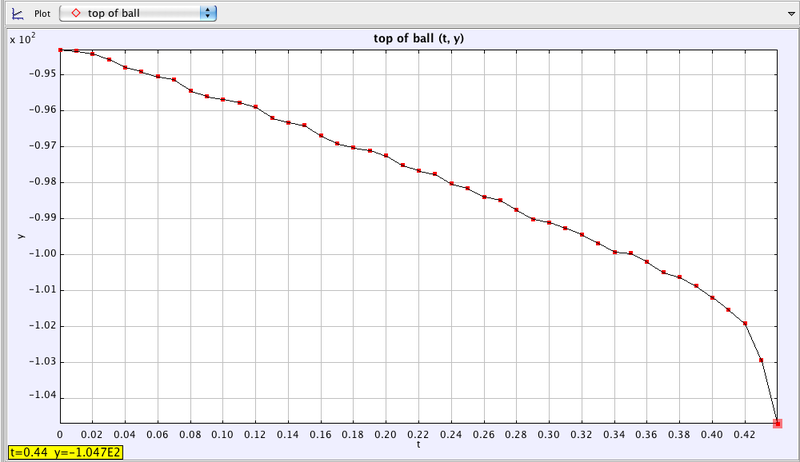 Note the beginning of non-zero downward acceleration of the ball at that point. The constant downward velocity of ball before the slinky is released, and its continuing constant velocity of approximately the same magnitude after release, make me think that this velocity is not due to the release at all. If Rod Cross had been able to hold everything stock still before release, I think we would see the ball stay at rest for awhile. What do you think? Have I missed something? About a week ago, Derek Muller ( of Veritasium Science Videos) posted a series of three videos on what happens when you drop a hanging slinky. The videos use some high speed video footage to observe how the lower end of the slinky hovers (quite unintuitively) in place as the top of the slinky falls. The videos first came to my attention Thursday morning when Frank Noschese tweeted that his students were all over the video, wanting to do their own slinky drop. 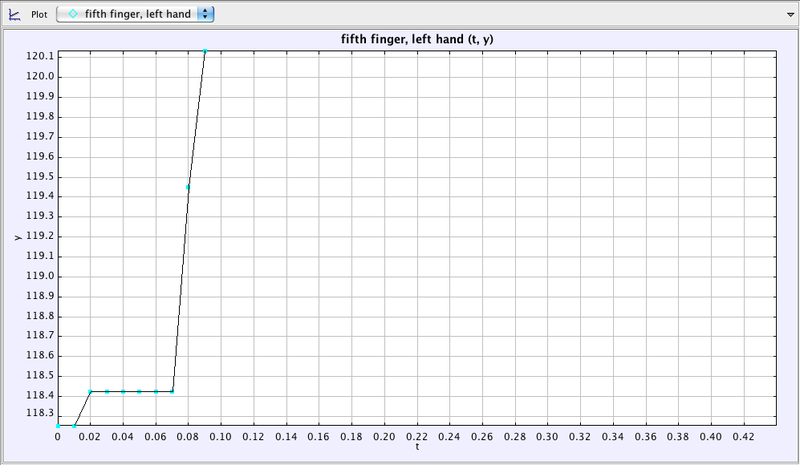 Later that morning, Rhett Allain posted a Vpython computational model of a falling slinky… cool! Now Thursday was a tough day for me. My students in my second year physics class had done a poor job on a problem set and a “meh” job on a test, and it was clear I needed to give them a “pep talk” about level of effort and seriousness of purpose. To complicate matters, I was in the throes of a bad cold, leading to several nights of insomnia. I was grouchy and did a poor job of “inspiring” my students in class when I spoke with them about their poor performances. They were sitting there, looking like puppies with their tails between their legs, so I said, “Ok, enough of that… you know what to do in the future. Let’s do something fun now,” and we watched the slinky drop videos. And we dropped a super long slinky ourselves from the top of the science building. And we started discussing the physics, which led some to propose using Tracker to analyze the motion. I realized that if we wanted to do a good job of analyzing the video, we needed the raw high speed video of the drop and something in the video to set our scale. A quick tweet to Derek resulted in all the information we needed by Friday morning. So Friday rolls around, and I have my other section of advanced physics. They are ahead of the class I had Thursday and that other class was going to be mostly missing for Saturday’s meeting due to SAT’s. So I decided to let everyone loose on Tracker with the high speed video. Most of the class was spent just learning the software, but a few students were able to confirm Rhett’s computational model (see the comments on Rhett’s blog). Now I’m two days behind my syllabus, but I think my students are far ahead of where they were on Wednesday. The discussions we’ve been having about forces on various parts of the slinky are detailed and nuanced in ways that my students’ problem sets weren’t. We’ve just finished talking about Young’s modulus and the speed of sound in solids, so this is an excellent “weak spring” example for them to ponder. And, in a huge win, I convinced at least one student to post a comment on a blog. I tried to get them to email Rhett and Derek, but they are too shy for that. Soon, maybe. In addition to energizing my second year physics class, the slinky work gave me something to do with my Friday afternoon first-year class, which had been decimated by early sports dismissals. While the six students in attendance did not do video analysis or read Rhett’s blog, they did get to drop a really, really long slinky from the third floor in our main building (in the stairwell, right near the main entrance, where we captured the attention of a bunch of freshmen and some visitors… win!). And they were able to discuss what must be true about the forces on the top and bottom loops of the slinky (after I told them that the video analysis shows the ends have constant velocities). The Balanced Force Particle Model pays off in the real world. REAMDE: When does gamification work? While I’ve been too busy with the start of school to post anything on this blog, I somehow found time yesterday to start reading Neal Stephenson’s new novel, REAMDE. Once I got started, it was hard to put down (although I’m in no danger of finishing this beast anytime soon). About 12% of the way into the book Stephenson describes a marketing scheme pursued by an MMPORG that appears to be one generation beyond World of Warcraft. The marketing scheme involves letting users program their own apps within the game in order to do actual real world work disguised as medieval warfare (with all the goblins, dwarves and elves you would expect in such a game). The apps thus developed take the most stultifying, boring and mindless work (think TSA agent watching a single exit for eight hours, scanning widgets for imperfections as they roll past on an assembly line, or sitting in a business meeting) and turn them into a game. In some scenarios, the players in the game actually help the worker. Stephenson makes the case that boring and mind-numbing tasks result in a rewiring of the brain so that fewer neurons (and less energy) are spent on the task. Neurons are reallocated away from areas of the brain responsible for repetitive, boring tasks (thus increasing the probability of mistakes when that occasional “interesting” thing happens) and toward areas that are being used more. Gamification of the boring task brings attention and energy back to the boring task by making it more complex and interesting. Thus fewer mistakes are made and productivity increases. So this got me thinking. Why would I gamify learning in my classroom? Do I really think that physics (or math) is so simplistic, boring and repetitive that the areas of the brain responsible for doing these tasks is atrophying? No way. We don’t need no stinkin’ badges in my classroom. Gamification is not required, because the job itself is interesting, connected, deep and engaging.